Healthy Cooking with Cinnamon: Used in cooking, cinnamon aids digestion and is recommended by German Commission E for treating loss of appetite and stomach upset. 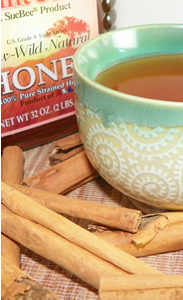 Cinnamon prevents bloating and flatulence and treats heartburn and nausea. For a more intense, spicy cinnamon choose Cinnamomum cassia. 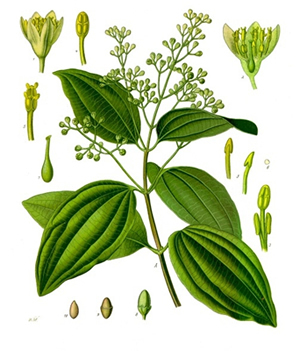 Ceylon cinnamon, Cinnamomum zeylanicum, has a sweeter, more delicate flavor. 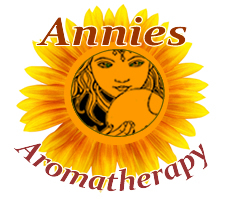 The oils of both contain cinnamic aldehyde as the major component, with cassia having the larger amount. The aroma of cinnamon evokes memories of Christmas kitchens, warm, spicy and intensely fragrant. Ayurvedic Medicine Cinnamon, Twak ,pacifies vata and kapha may stimulate pita in excess. Pungent vipaka warms and energizes the whole body. Good for toxic (ama) conditions. 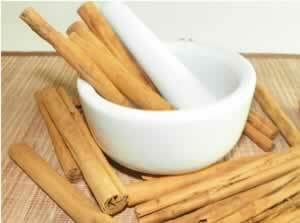 Cinnamon Side Effects: Cassia cinnamon contains coumarin, Cinnamomum zeylanicum, sweet cinnamon only has trace amounts. Taking large amounts of cassia cinnamon over time might worsen bleeding in some people. Cassia oil is very irritating to the skin and should be handled with care. The distinct, spicy aroma of cinnamon bark, Cinnamomum cassia, or Chinese cinnamon, is the spice sold as cinnamon in the United States. Ceylon cinnamon, Cinnamomum zeylanicum, is considered the true cinnamon in most of the rest of the world. The two are similar in taste, though Ceylon cinnamon has a sweeter, more delicate flavor. These two trees are very similar in looks, flavor and taste. The oils of both contain cinnamic aldehyde as the major component, with cassia having the larger amount. One of the first known spices, Romans believed cinnamon's fragrance to be sacred and burned it at funerals. James Duke. "The Green Pharmacy Herbal Handbook" Rodale Books, (2000) The answer for those seeking to use cinnamon for a serious health problems like diabetes may be taking cinnamon in supplement form, however anyone already diagnosed with high blood sugar should seek advice on dosing from their doctor.